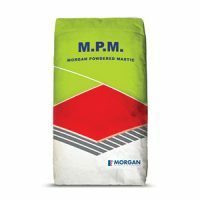 Morgan’s cementitious one pack, flexible, fast setting, rubber based adhesive. Powerflex when cured exhibits water resistance, high bond strength, and superior flexibility. Installations can usually be grouted after only 3 hours. Powerflex has specifically been formulated for acoustic applications. Give your tiles superior flexibility and great bonding strength with Powerflex; a cementitious one-pack tile adhesive that is incredibly fast-setting. Powerflex is rubber-based and is suitable for use both on floor tiles as well as on wall tiles. 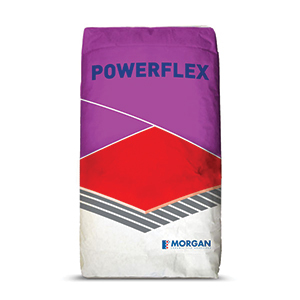 Powerflex is available in a standard 20kg bag. 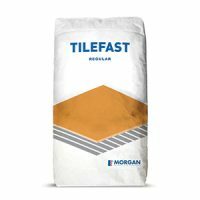 This tile adhesive is incredibly versatile and is suitable for use on cement rendered substrates, primed plasterboard and painted substrates. 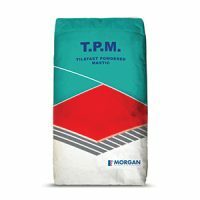 It is ideal for use on non-porous tiles including porcelain, fully vitrified, monocttura, bicottura and natural stone tiles. However, it is not suitable for porous tiles, moisture sensitive substrates, MDF or timber and substrates which are immersed in water. Powerflex is an incredibly quick setting tile adhesive which allows you to start with grouting in as little as 3 hours. When cured, it exhibits excellent flexibility, high water resistance, and superior bonding strength. Trust that your tiles will be perfectly bonded by using this adhesive. For a versatile and flexible tile adhesive in Perth, look no further than Powerflex at Ross’s Discount Home Centre. Buy this tile adhesive at an unbelievable bargain from our online store today!